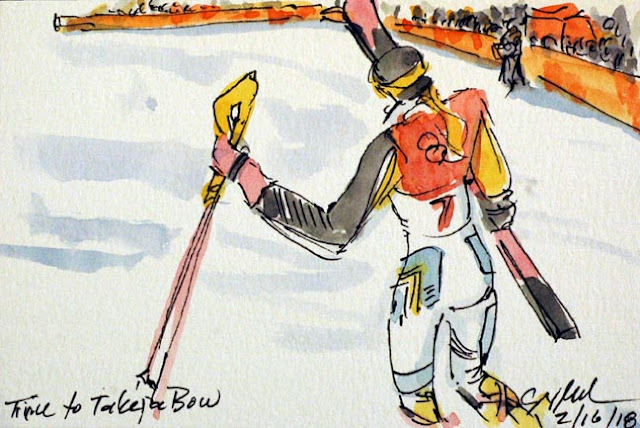 The final event of the games is traditionally the women's 30 K mass start in cross country skiing. Early in the race those who would be a factor at the end were making their presence known. Stinna Nilsson (Sweden) was leading with about 3/4s of the race left to go. She went on to finish with the Bronze Medal. Behind her is Marit Bjoergen (Norway) who later escaped on her own to win the Gold Medal. Behind her teammate was Ingvild Flugstad Oestburg who finished the day in 4th place. 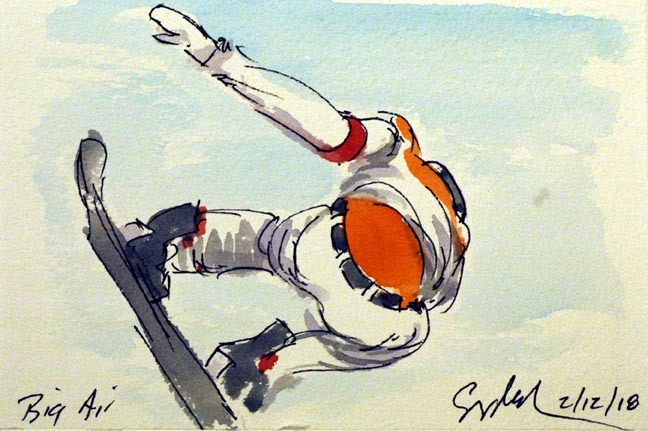 This is a small 4x6 inch original watercolor painting that is available by emailing me at greigsart@gmail.com. Since it is an original it is first come first served. It is $75 plus shipping. The painting was created using Yarka St Petersburg watercolors from Richesonart.com. And yes, international shipping is available. 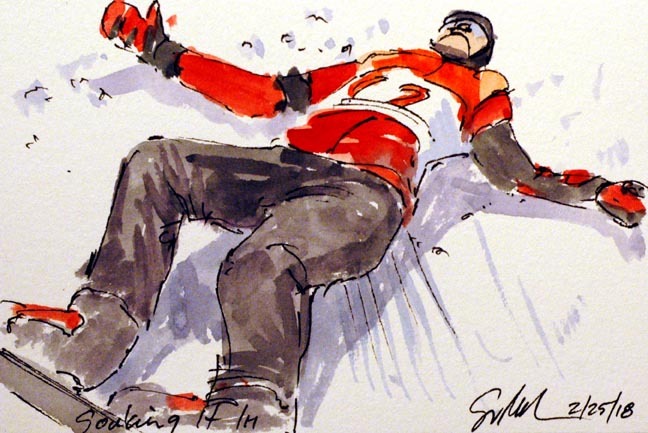 After winning the Gold Medal in the Men's Parallel Giant Slalom Nevin Galmarini (Switzerland) laid down on the snow at the end of the race. Not so much in exhaustion but in disbelief at his accomplishment. It was just a moment to absorb his success and the roar of the crowd. Ester Ledecka (Czech Republic) did something that has never been done in the Olympics before. She won a Gold Medal earlier in the Women's Super G (a skiing event) and today took Gold in the Women's Parallel Giant Slalom in snowboarding. No Olympic athlete has won Gold medals in two different sports in a single Olympic games until Ledecka did it today. This was the women's mass start in speed skating, the first time this race has been an Olympic event. 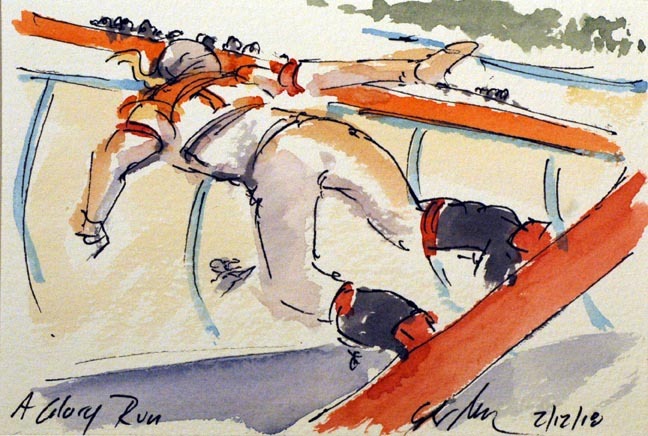 It is based on a similar event in track cycling. Riders gain points in three intermediate sprints during the race, and if a skater can lap the pack they will gain 20 points. The final sprint earns the first across the line 60 points, so it still comes down to the finale. Going into the final corner of the race in was Irene Schouten (Netherlands) on the front followed by Nan Takagi (Japan) with Bo-Reum Kim (Korea) on her wheel. It was Takagi taking Gold, with Kim in for Silver, and Schouten for Bronze. Whenever I watch mass start cross country skiing, all I see is cycling on skis. Today it was a three man break that got away from the peloton to ski for the medals. Alexander Bolshunov (Russia) led his rival, Iivo Nikanen (Finland) for most of the final laps. 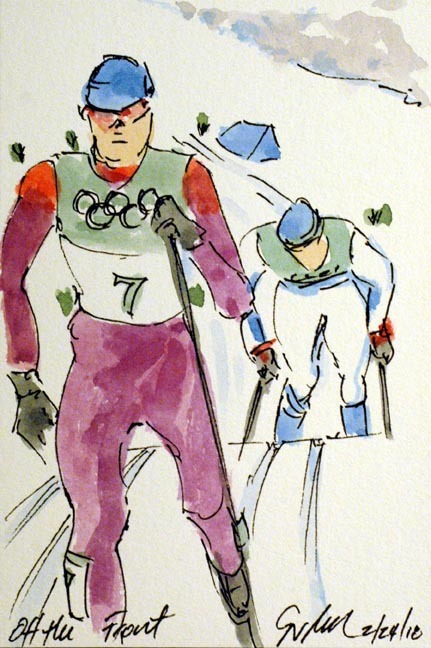 Nikanen was using the technique of drafting allowing Bolshunov to do all of the work while he waited for the final sprint. His plan work earning Nkanen the Gold, with Bolshunov coming in for Silver. 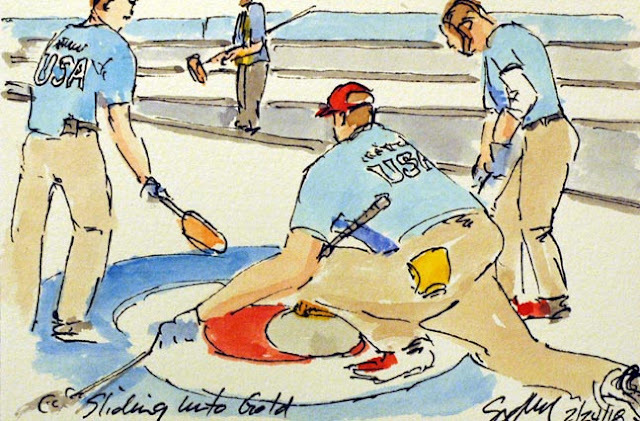 Every four years, every one seems to fall in love with curling. This year in the States it will be even more intense since the American men won the first Gold Medal in the sport in USA Olympic history. These Olympics have seen the USA winning Gold medals in sports they have never medaled in before. 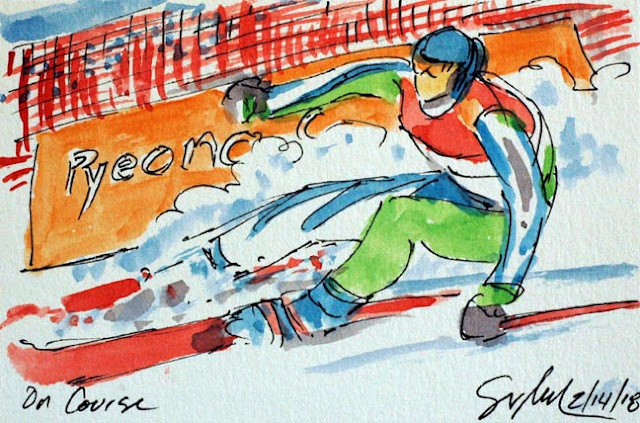 Ski Cross, and Snowboard Cross, are a bit insane. However they are rather exciting to watch. 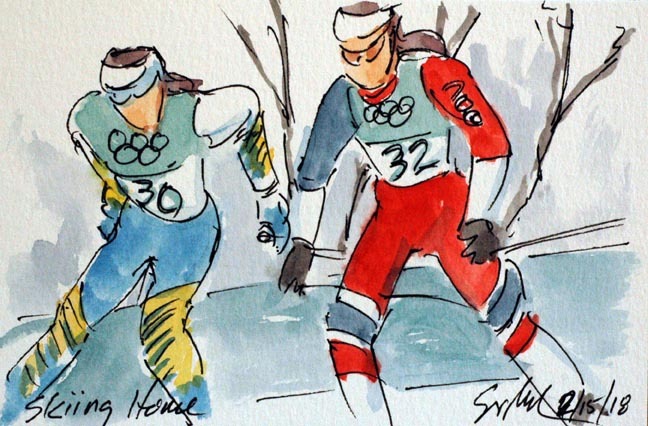 This is Fanny Smith (Switzerland) and Sandra Naeslund (Sweden) skiing their way down the course and into the gold medal finals. 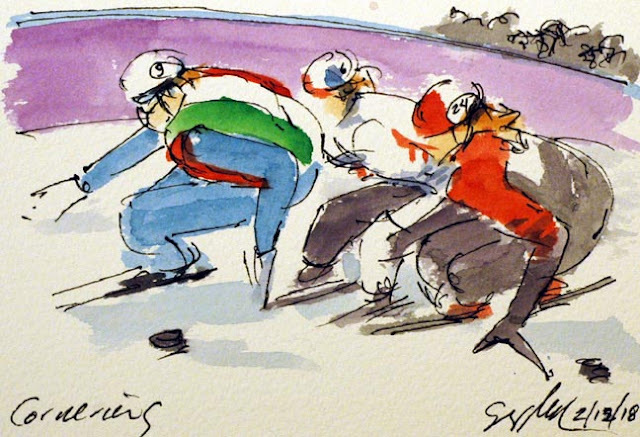 The finals in the Women's 1000M Short Track was quite the exciting race. With two South Koreans in the race, Sukhee Shim and Mimjeong Choi, whipping up the crowd. As they women came into the final lap, however, one of the Korean women went down taking her teammate with her. 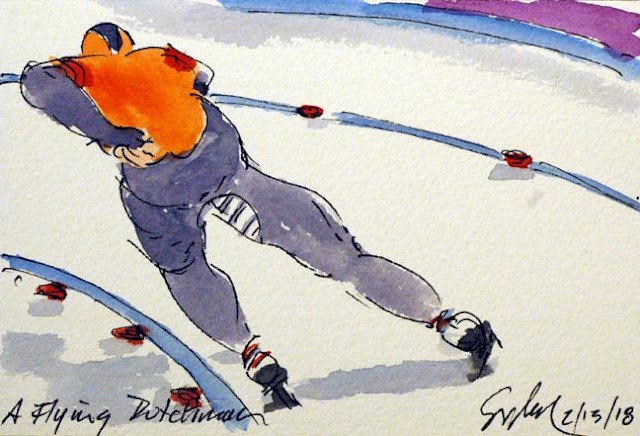 In the tight corners of short track, there is a lot of traffic and competition for a piece of ice. It was Suzanne Schulting (Netherlands) taking Gold, followed by Kim Boutin (Canada) for Silver and Arianna Fontana (Italy) grabbing the Bronze. 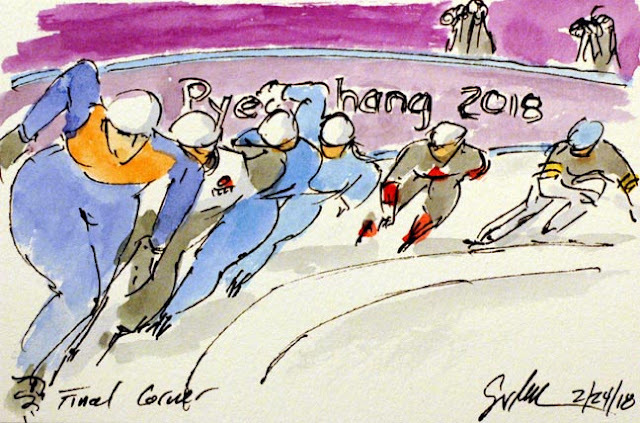 It was the home country skater Tae-Yun Kim (Korea) who lit up the crowd as he flew around the ice oval in Pyeong Chang. When he finished he held the best time thus far in the men's 1000M event. He ended up with the Bronze Medal much to the delight of the Korean fans. 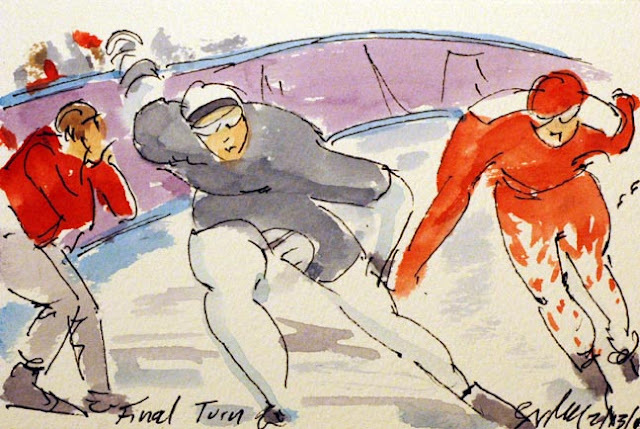 Norway added to its record breaking medal tally, with another Gold and the Nederlands added a silver to their impressive speed skating medal tally. It was Jocelyne Lamoureux (USA) who looked in the tying goal for Team USA. It was her goal that put the game into overtime. After twenty minutes of a scoreless overtime, the game went to a shoot out. After each team had five shots on goal, the game was stilled tied. 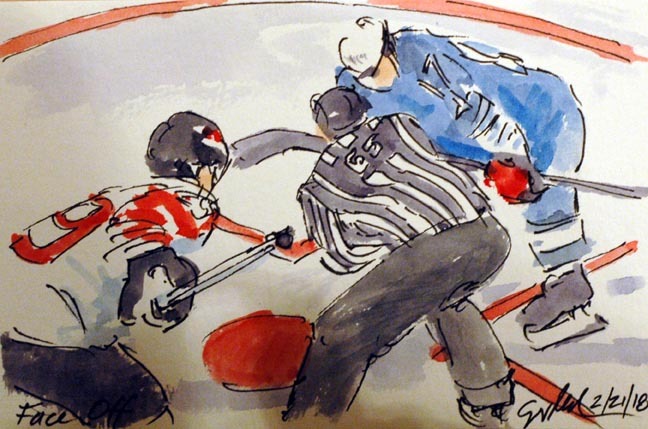 It was the sixth shot on goal, made by Team USA and missed by Team Canada that decided the game. It was Gold for the American women and Silver for the Canadians. 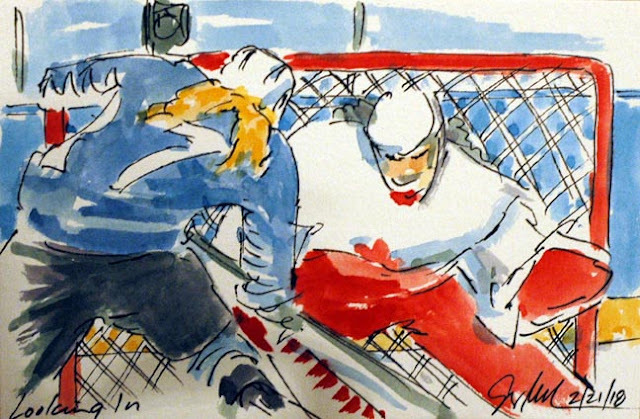 Seems appropriate to paint this scene for the Women's Hockey Gold Medal game. Team USA and Team Canada have faced off for the Gold for three Olympics in a row now. In their round robin game, Canada won by a goal with the Americans almost scoring as time ran out. At this point in the game, the score was 2-1 Canada. Team USA was up for the fight. I am currently traveling and do not have my normal set up for photographing these watercolors. 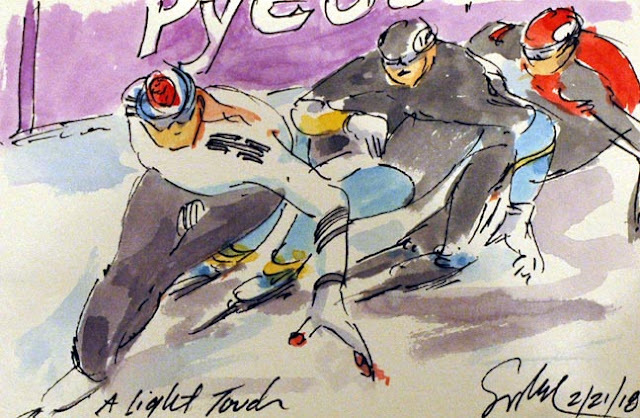 Put I love both watching and painting the Olympics. I am currently in Colorado to see our brand new grand daughter, so I apologize for the shadow and the cropping of this image. 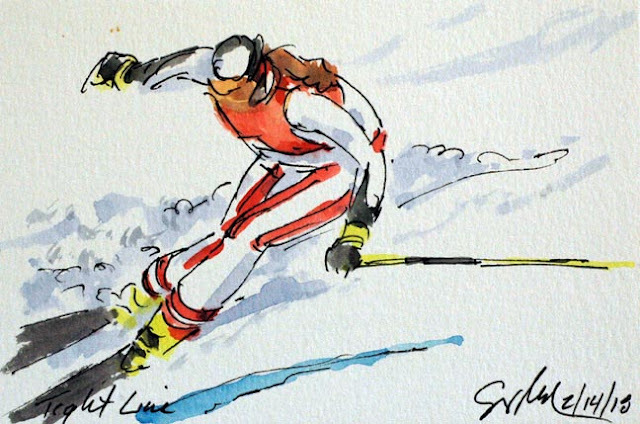 This is Michelle Gisin (Switzerland) on her way to a Gold Medal in the Women's Combined in Pyeong Chang. 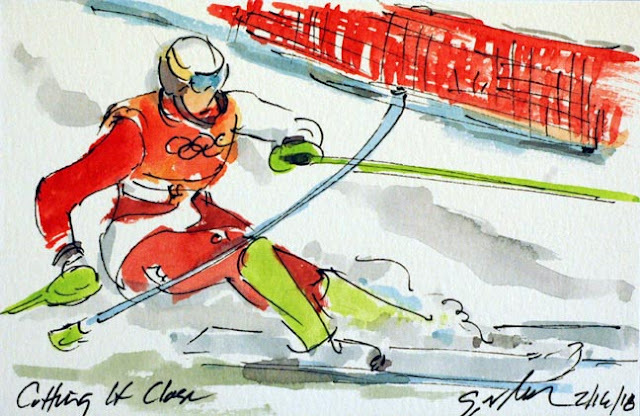 Mikaela Shiffrin (USA) was laying down a brilliant run in the slalom race of the Women's Combined. Her time was enough to put her into first place, giving her a shot at winning her second Gold Medal of these games. It was not to be, but she did take Silver in this event. 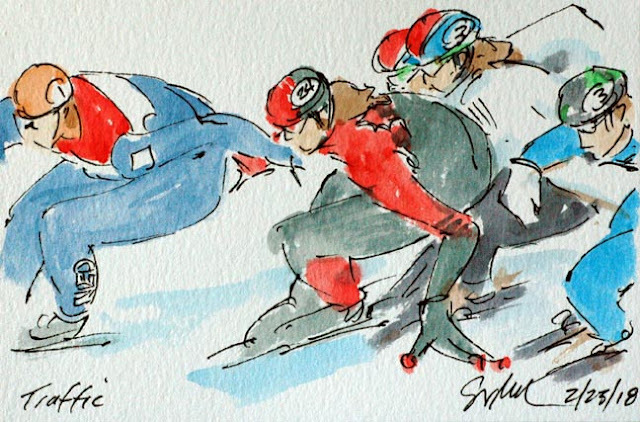 I will admit it, short track is my favorite skating event in the winter Olympics. This is from the Women's Relay qualifying events. The home team of South Korea is leading the Australians and Chinese into the final turn of the quarter finals. The USA women, Heather Bersma, Brittany Bowe, Mia Manganello, Carlijn Schoutens, skated beautifully in the Women's Team Pursuit. I am reminded of the Team Time Trial in cycling when watching these women draft each other while chasing down the Polish team on the other side of the track. They ended a 16 year drought winning Bronze in this event. Living in Richmond, Virginia, it is exciting to see one of our own, Hakeem Abdul-Saboor (USA), competing in the Olympics. While he and his driver, Cunningham, did not medal, nor finish about 21st place, it is truly an honor just to be at the Olympics. I am sure it is an experience he will treasure of the rest of his life. Wow! Ester Ledecka (Czech Republic) is the first Olympian, male or female, to take medals in both snowboarding and alpine skiing in the same olympic games. After medaling in the Women's Snowboard Slalom, she came out today to claim Gold in the Women's Super G.
With apologies, but some times a good title is still good even if it has been used. It wasn't until I was photo editing that I realize I had already used this title. In this case, it also applies to her time, one that just barely put her into the gold medal position at the line. At the end of the day it was the Bronze Medal for Tina Weirather (Lichtenstein) continuing the medal winning family tradition. The American, Lindsey Vonn, was the first women to take the the Super-G course, an unenviable position. She naturally posted the first best time, but managed to hold that ranking for some time. Alas, she finished the day tied for sixth place. 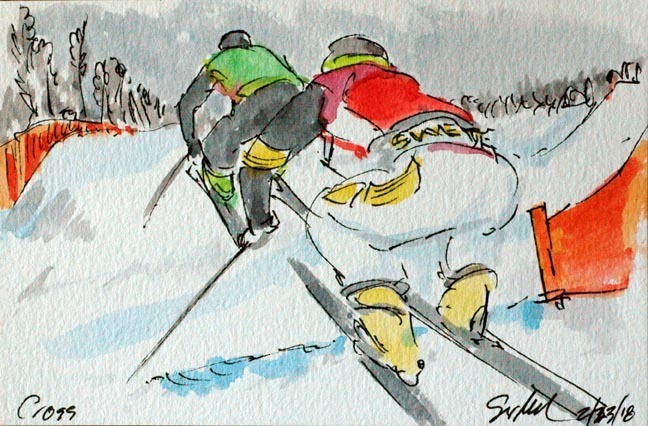 Once her final real challenger had completed their slalom run ever so slightly slower, it was time for Frida Hansdotter (Sweden) to take her Gold Medal bow. Chapeau! 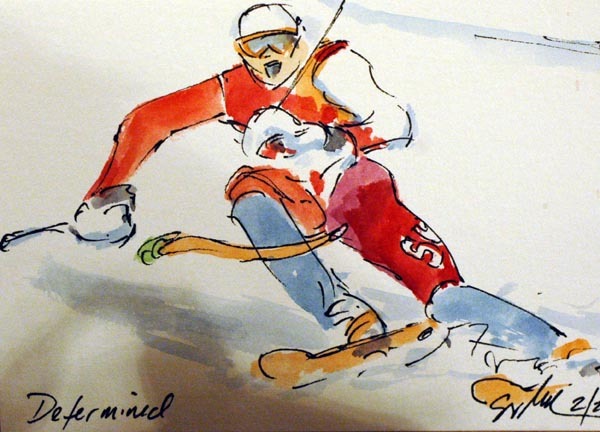 In slalom skiing, it doesn't matter if you hit the gate with you body, as long as your skis go on the correct side of the base of the gate. Actually, the closer you are, the more likely it will be a better time at the line. 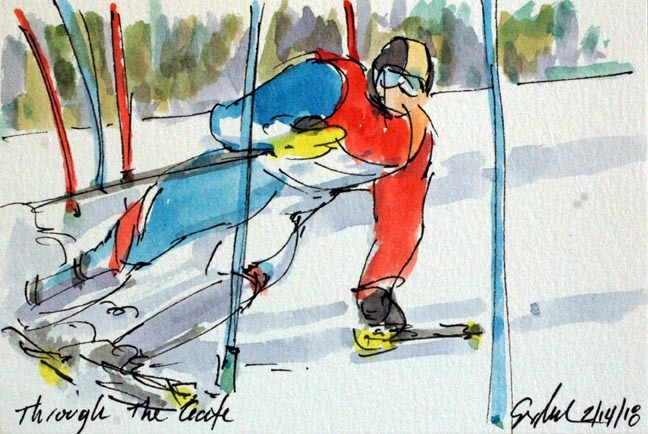 Skiers will wear a protective face guard, along with wrist and shin guards to prevent being injured by the force of striking the poles at 70 kilometers an hour or faster. While Denise Feierabend (Switzerland) was cutting this gate to perfection, her run was not enough to get her onto the podium in Pyeong Chang. 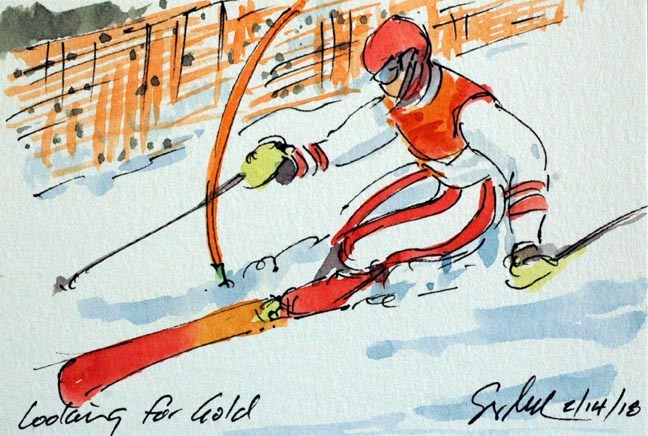 It was the Austrian, Katharina Gallhuber who carved up the Women's Slalom for the Bronze Medal. An while I am trying to share around who gets painted from what countries, the Austrians are just owning the Alpine Events, and the prize for best kit. The American, Jess Diggins, was posting very impressive times as she neared the finish line in the Women's 10K. Going as hard up the final climb as she possibly could, she managed to finish the day in 5th overall. A great showing since due to the tie for Bronze, she was only one step (or just 5 seconds) off of the podium. It was Marit Bjoergen (Norway) putting in the best times all along the course of the Women's 10K Freestyle today. Bjorgen passed Ebba Andersson (Sweden) who had started a full minute ahead of her on her way to the finish line. The Norwegian held the lead at the line, but a couple of her countrywomen were chewing up the snow behind her. Ultimately she ended the day in a tie for the Bronze Medal. 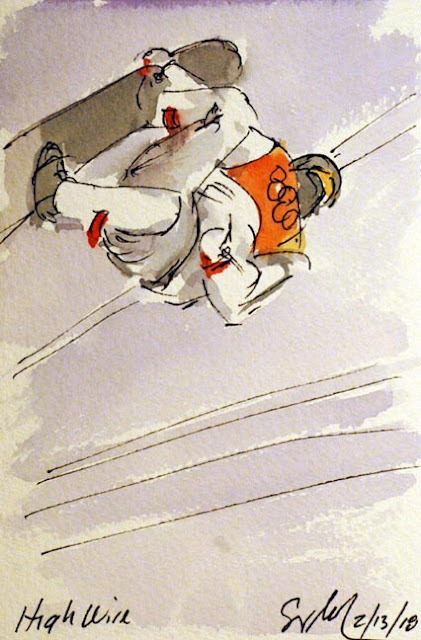 Since I paint these images from live feeds, I didn't manage to get a painting of any of the other medalists. Mikaela Shiffrin (USA) defended her medal in the Women's Giant Slalom brilliantly today. She was the second to last of the contenders to hit the slope in Pyeong Chang and put in a flawless run. 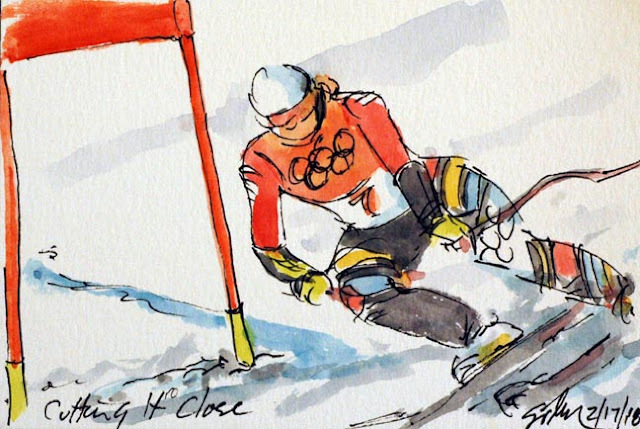 She took gold in the first of the women's alpine events that had been delayed to do bad weather on the mountain. Chapeau! I confess that part of the reason I painted Meta Hrovat (Slovenia) was the brilliant green of her ski suit. Sometimes you just have to go for the colors. However her run had her finishing with the best time at the end of her run. Sadly, she eventually slipped down to 14th on the day. But she looked good doing it! 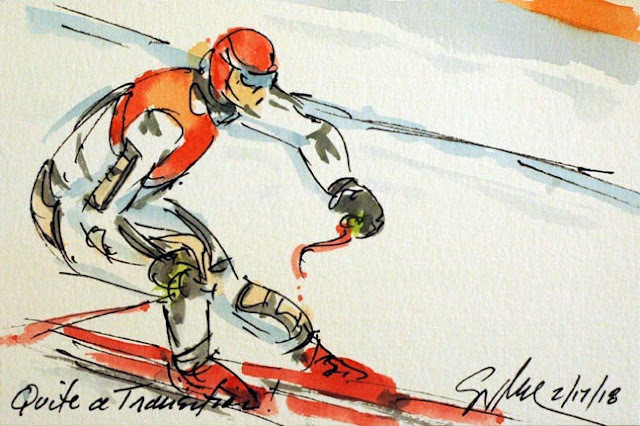 The grace and speed of skiing lends itself nicely to painting. 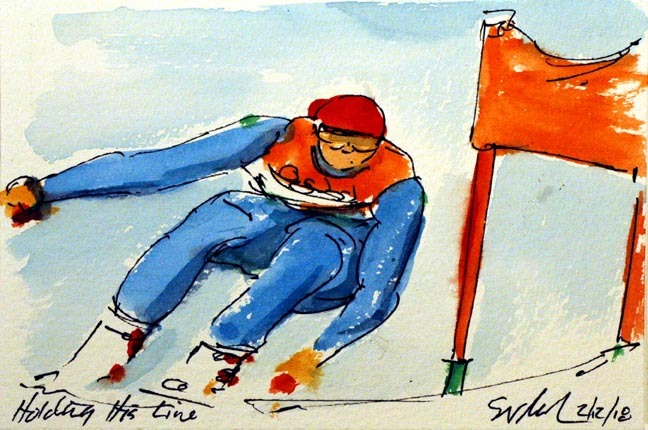 I have always loved capturing the figure, movement and color on paper, and the alpine events lend themselves nicely to that passion. Ricarda Haaser (Austria) laid down a great run to top the leader board as she finished. 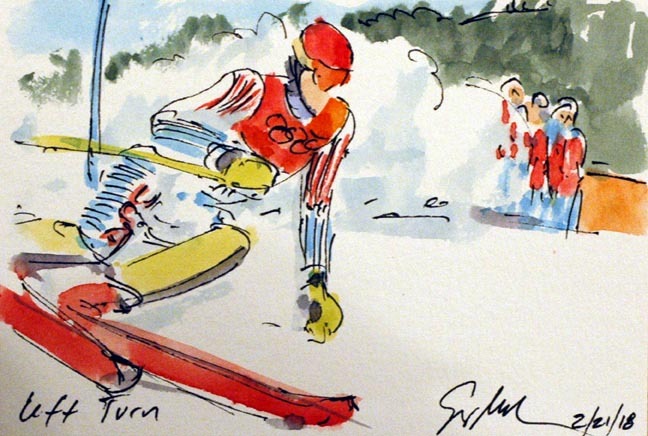 Too bad for her that some of the big names in her sport were yet to take on the second run of the Women's Giant Slalom. She finished the day in 17th place, yet she did spend some time on the leader's box watching the rest of her competitors. It is always nice when the guy taking the Gold Medal also has one of the best kits on the hill! Marcel Hirscher (Austria) showed why he is considered the best at the slalom. 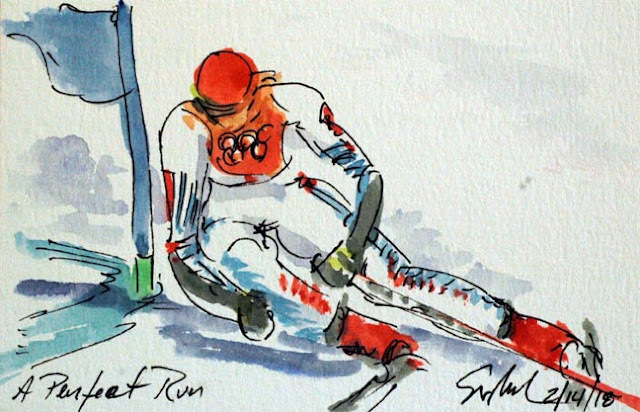 His brilliant run earned him the win in the Men's Combined. With the limited time I have for painting these Olympics I am picking a choosing the events that interest me. Always a sucker for speed, here are some pieces from the Men's Combined-Slalom. This is Victor Muffat-Jeandet (France) laying down a great run that put him into first place at the bottom of the hill. Unfortunately, he wasn't the last man down the hill. 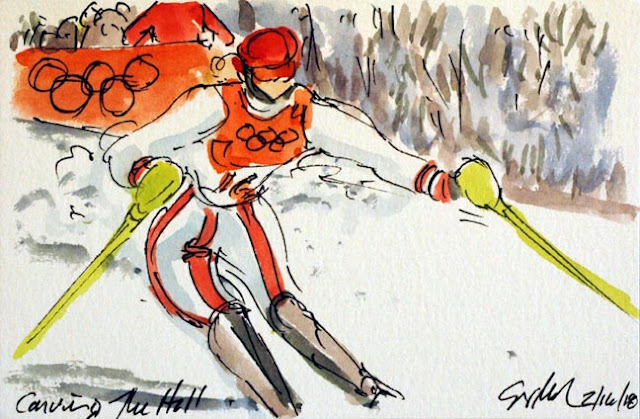 His time did hold up enough to give him a Bronze Medal, the first French medal since 1948 in Alpine Skiing. 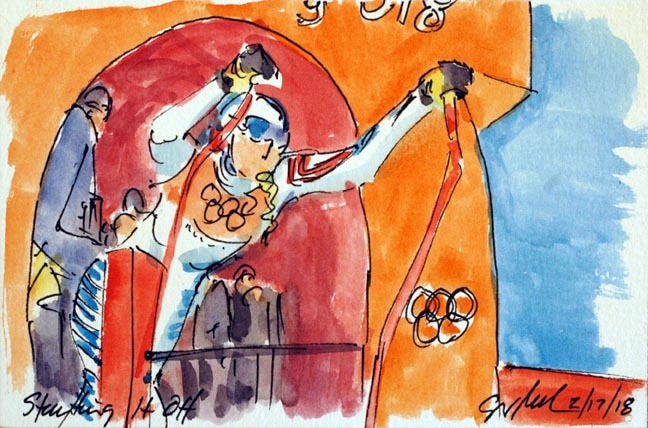 Much of the Olympics are about being able to handle the pressure to perform. For Shaun White (USA) who already has two gold medals in the Men's Half Pipe, one would think he didn't even need to come to Korea to compete. But then there was his bad run that left him without a medal in 2014 of any kind. Athletes and the rest of us, don't like to leave the stage on a low note, so he fought back to the top of the game. Today, he laid down a brilliant run with some truly big air on his final run to burnish his golden image, and to add to his collection of gold medals. Well done, Shaun! It was Kjeld Nuis (Netherlands) who continued the Dutch dominance in the speed skating discipline. He was able to turn in a better time than his countryman, Patrick Roest, to claim the gold medal in the Men's 1500M race. 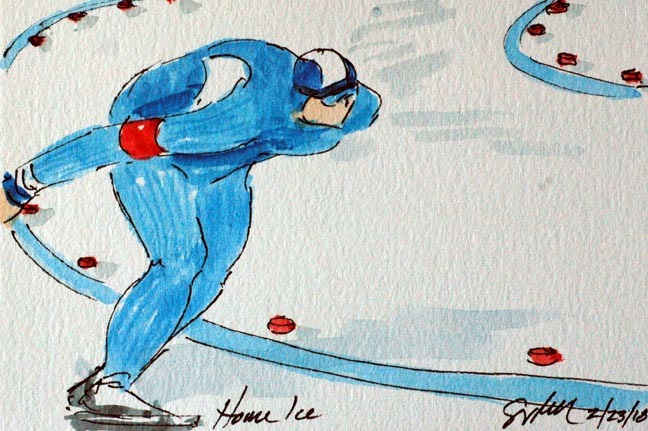 The bronze was taken by the host country skater, Min-Seok Kim (South Korea). 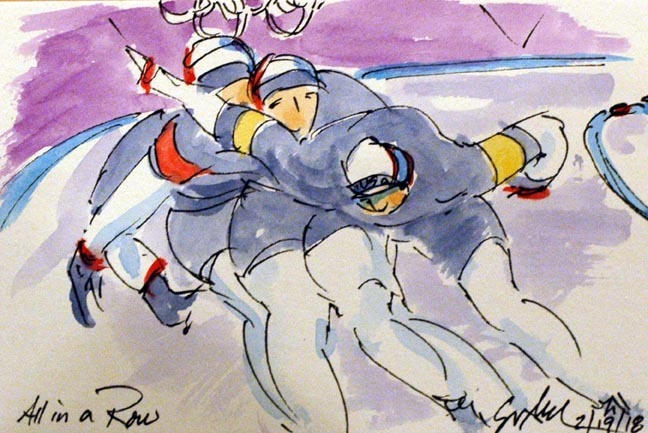 Team USA dominated the Olympic Athletes from Russia taking the round robin match 5 to 0 in the Women's Ice Hockey match up. It was Jocelyne Lamoiureux stuffing in the second American goal on a solo break up the ice and into the net. It is looking like the women will repeat their appearence in the gold medal game, hopefully with a slightly better result than 2014. The Men's 1500M Speed Skating race did not go as either the Americans nor the Polish were hoping. While both Brian Hansen (USA) and Zbigniew Brodka (Poland) got off to a very fast start, neither were able to hold their advantage to the line. Brodka took the win in this pairing, but was unable to repeat his gold medal from 2014. In fact, neither were able to get on the podium despite their coaches yelling encouragement from the sidelines. 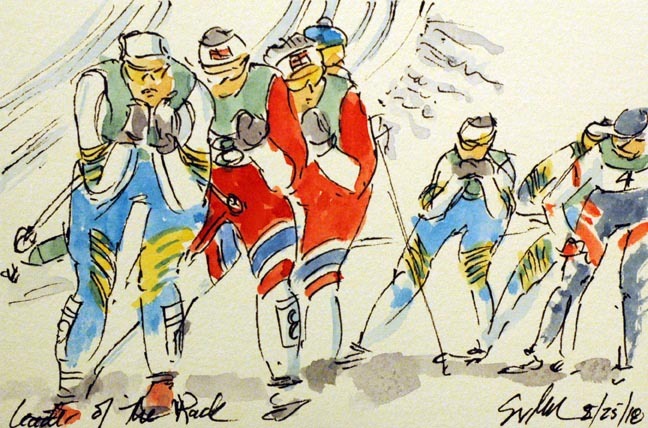 One of my favorite Winter Olympic events is the Short Track, possibly because this is one of the sports I enjoyed as a teenager (not that it was called short track back in the 70s). In the finale of the Women's 1000M race, it was A. Fontana (Italy) leading into the final turn. Behind her, M. Choi (South Korea) was fighting for position with K. Boutin (Canada). As they crossed the line, it was the Italian taking the victory, with the Korean coming in second. 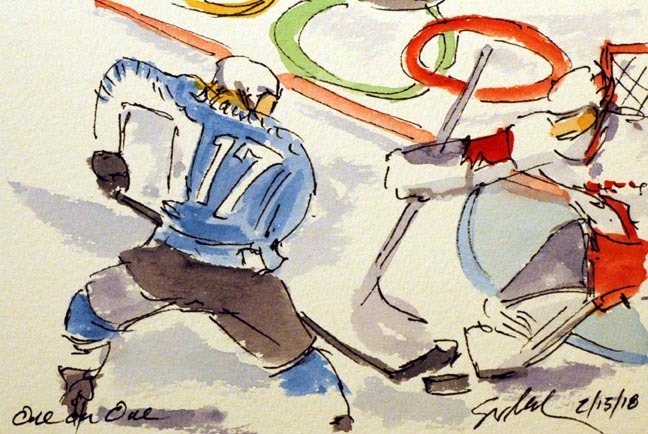 The battle for the best line literally pushed Boutin out of medal contention. Choi was disqualified, moving Boutin into the Bronze Medal. 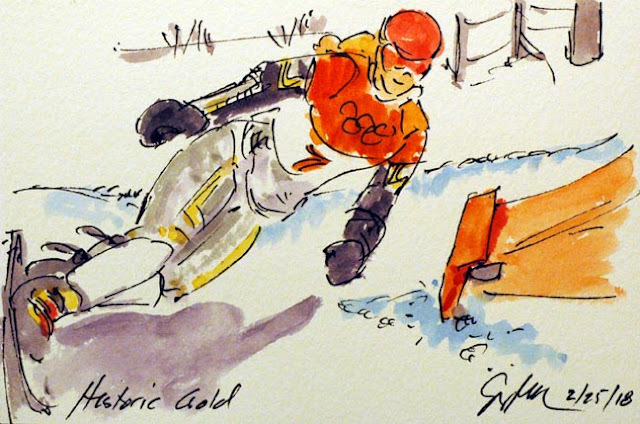 And, yes, Fontana took the Gold. 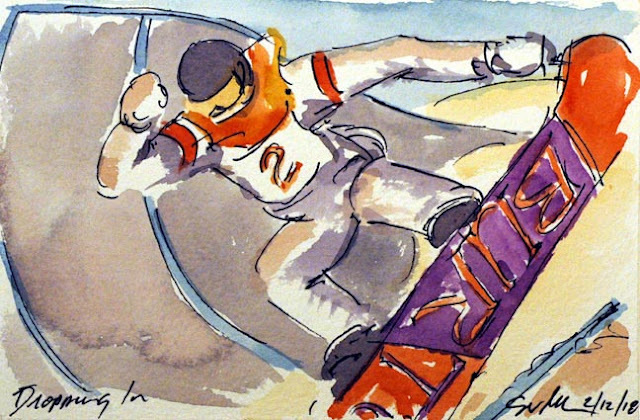 After the women had finished their Half Pipe competition, it was time for the men to take the stage. Today was qualifying runs to weed down the field to just 12 riders. Apparently, Ben Ferguson (USA) didn't get the memo about dialing back his run. He got really big air on his first hit, and just kept going. He went into first place on his first run, where he sat until his more famous teammate, Shaun White hit the pipe. 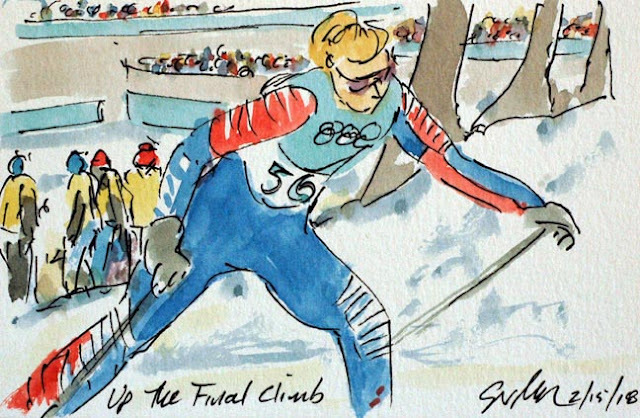 Today was the first of the two races that make up the Men's Super Combined. First is the downhill portion of the race, with the slalom coming tomorrow. This C. Innerhofer (Italy) on his run down the hill in South Korea. Before Chloe Kim (Team USA) started her final run, she knew she had already done enough to claim a gold medal in the Women's Half Pipe. Yet, she showed her class by going big, and posting her best numbers in the competition. This to me is what an athlete must do, you can go half steam, you must go full gas - always. However, I just couldn't resist painting today's events as I watched them play out on my television screen. 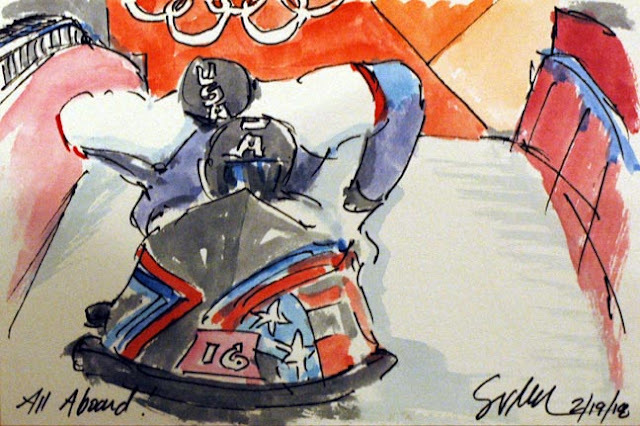 This is the American, Kelly Clark, as she puts in her Bronze Medal winning ride in the Women's Half Pipe finals.